Is the Wichita mayor satisfied with this? A gloomy jobs forecast is greeted with apparent approval by Wichita Mayor Jeff Longwell. 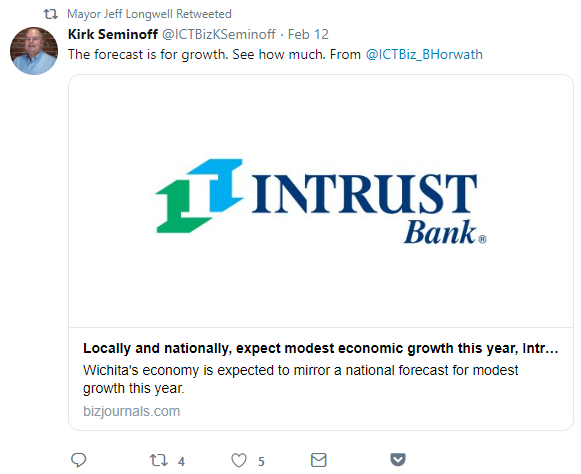 We have to wonder: Did Wichita Mayor Jeff Longwell read before tweeting? The Wichita economy saw jobs lost in 2017, but improved last year. Job growth is expected to trend slightly higher in 2019, buoyed by manufacturing and professional services. We anticipate the Wichita economy to expand this year, but grow at slower rate than the U.S. and the majority of metro areas. Business/consumer optimism and aerospace demand should help power the local economy; however, trade issues, commodity prices, lack of skilled labor, and slow population growth will likely limit growth in southeast Kansas. There’s not much good news in this forecast, except that job growth is expected to grow rather than decline as it did two years ago. So we have to wonder why the mayor retweeted — presumably approvingly — this grim forecast. Several times Longwell and other city officials have promoted a study claiming Wichita is a highly “recession-proof” city. That study is nonsense and ignores key economic data and the definition of a recession. See Wichita mayor promotes inaccurate picture of local economy and Wichita, a recession-proof city. 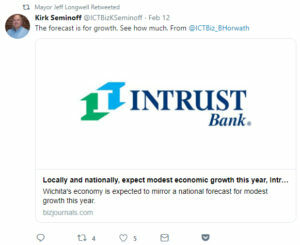 Responding to a different forecast of job growth in Wichita for 2019, Scot Rigby, who is Assistant City Manager, Director of Development Services for the City of Wichita, tweeted “great news.” But that forecast is as gloomy as the Intrust forecast, with job growth expected to be about half the national rate. 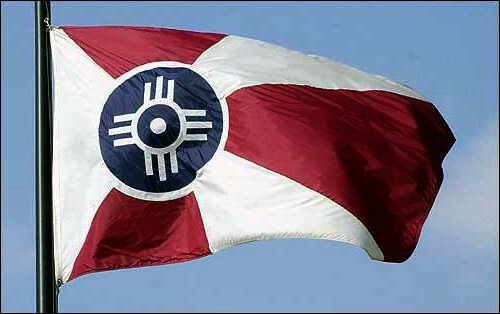 See Job growth in Wichita: Great news? Generally, Wichita officials are pleased with the local economy (Former Wichita City Council Member Pete Meitzner: “We have enjoyed great progress and growth during my two terms as a City Council member and I plan to do my part to assure Sedgwick County is part of this continued success.”) But the available statistics are grim and are improving only slowly. See Growing the Wichita economy. If Wichitans don’t read beyond the rosy headlines and tweets from the mayor and city officials, they will be uninformed, and unfortunately, misinformed by people we should be able to trust.